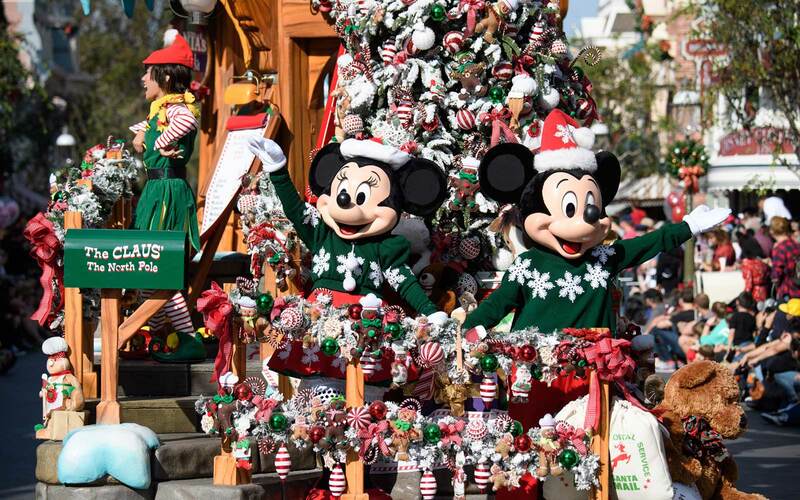 Holidays magically last longer at Disneyland, too, with the park filled with tinsel-topped joy through January 8th. Unless you nab a ticket to the North Pole, there’s no better place to celebrate winter than at Disneyland Resort. 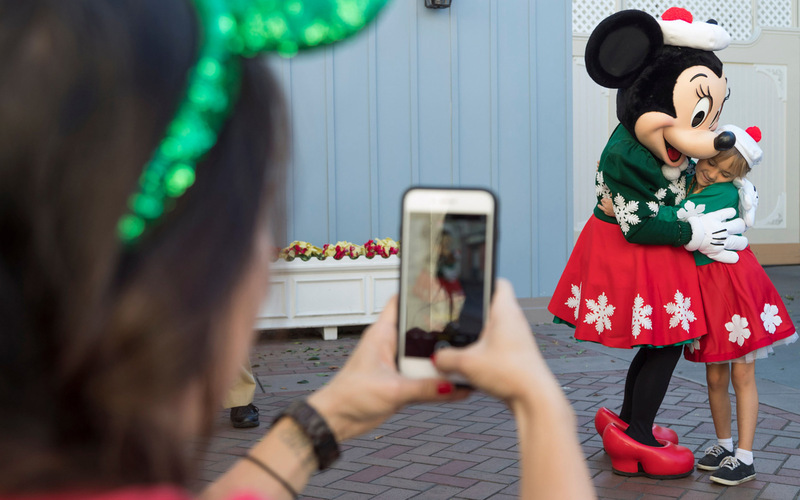 Holiday time at the parks is so much more than Christmas trees, parades and hugs from Santa Goofy — which happens to be a very real thing. Between the nightly snowfall, majestic gingerbread houses and celebrations of every seasonal holiday beyond just Christmas, there’s plenty worth coming back for time and time again. Thankfully, holidays magically last longer at Disneyland, too, with the park filled with tinsel-topped joy through January 8th. 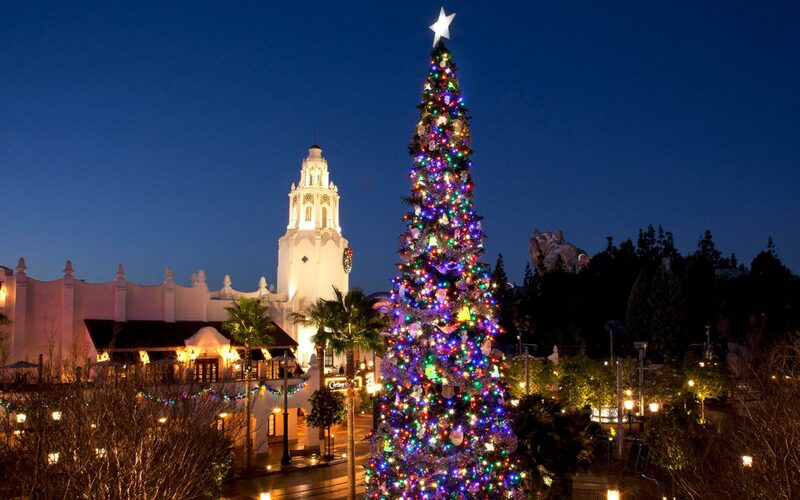 Disneyland doesn’t have a well-appointed tree — it boasts a 60-foot behemoth covered in lights and oversized ornaments. (The holiday emblem used to be fresh, but after an inopportune fire, live trees have since been replaced with artificial versions.) Holiday cheer can be seen everywhere from garlands and tinsel lining Main Street, U.S.A. to the storefronts of Disney California Adventure’s Buena Vista Street, along with photo ops, like Santa & his reindeer flying across a Hollywood Land backdrop and California Adventure’s own tree, featuring secret nods to Walt Disney’s origins throughout. Santa Claus is even on hand at the Redwood Creek Challenge Trail until Christmas Eve — as is Santa Goofy, who takes over through January 8th once the real work is done. Even Disneyland Park’s colorful afternoon parade is swapped out for a festive one, filled with themed floats, an appearance by royal Disney couples and even Santa. But our favorite part of A Christmas Fantasy Parade remains the quirky reindeers, toy soldiers and twirling snowmen dancing their way across Disneyland each day. Disneyland “decks the halls” on four of its attractions, which are completely re-themed to toast the holiday season. It’s a small world is completely overtaken by wintertime settings and new global rendition of “Jingle Bells”, while Haunted Mansion keeps its "The Nightmare Before Christmas" overlay, complete with its gigantic gingerbread house made from 90 pounds of the sweet stuff. 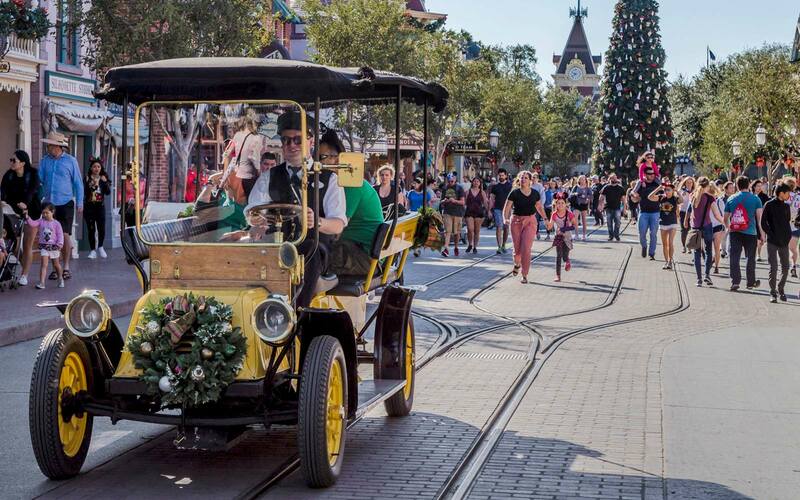 Over at Disney California Adventure, the entirety of Cars Land dresses up for the holiday — picture towering “trees” made from tire stacks — as Mater’s Junkyard Jamboree and Luigi’s Rollickin’ Roadsters play their own auto-inspired soundtracks throughout the winter months. 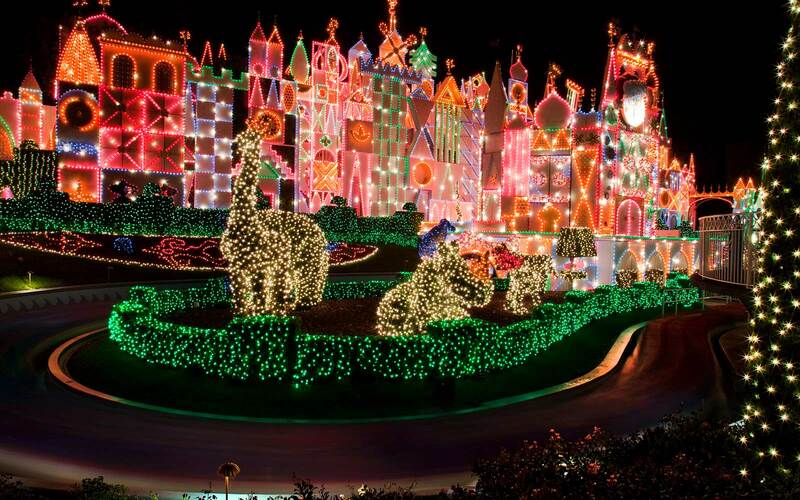 Sleeping Beauty Castle gets in on the festive spirit too, glowing bright with over 50,000 lightbulbs that make for a majestic display come nighttime, adding extra delight to Believe...In Holiday Magic, Disneyland’s nightly wintertime fireworks show. Huddling around the hearth, snow falling every night like clockwork — it may be nestled in Southern California, but Disneyland still manages to bring every cold weather tradition to life. Pop into Disney’s Grand Californian Hotel for a peek at the seven-foot-tall gingerbread house, made with fresh icing, white chocolate and peppermint. Holiday cookies, Mickey whoopie pies and hot apple cider are available on site as well, best enjoyed by the picturesque fireplace. Snow fills the sky by Main Street, U.S.A. and it’s a small world after each fireworks show, as well as throughout the night along the Grizzly Peak path leading Grizzly River Run. Disneyland Resort celebrate all wintertime holidays throughout November, December and January. The Disney ¡Viva Navidad! Street party fills the park’s Paradise Gardens with mariachi and samba music, folkloric dancers and fun character interaction with The Three Caballeros, as well as eye-popping oversized Santa and Mrs. Claus mojiganga puppets. Live performers, like a modern klezmer band and all-female mariachi band play sets throughout Disney California Adventure all season long, as modern takes on favorite foods from Hanukkah, Kwanzaa and beyond are offered at the festival food booths scattered across the park. And, early next year, Three Kings’ Day will bring a week’s worth of activities, entertainment and decor to Disney California Adventure. A couple hundred new desserts, dinners and drinks arrive to Disneyland Resort each winter; expect candy apples and krispie treats shaped like Mickey Santas, peppermint bark and macarons to give some warmth to the flavors of the seasons. 2018’s flavorful lineup includes eight new churro flavors, seasonal toffee and so much more.